If you follow Tip Top on Facebook you would’ve noticed that they have been teasing us with some of their new ‘collections’. Of course I need ALL of them but on a recent trip to Clicks I noticed a new polish I hadn’t seen before. I scooped it up and immediately compared it to some of the teasers Tip Top posted on Facebook. It was it! I had a hard time finding them as I visited 6 stores and could only find 4 out of the 6 shades. I am still looking for the other 2 desperately but in the mean time I am sharing the 4 I do have with you. I also think they have the cutest names. This is 2 beautiful coats with no topcoat. I absolutely love this colour. It reminds me of Tip Top – In the navy but just a bit lighter. It has the typical Tip Top shiny finish. Formula is gorgeous and you will be pleased to know this blue does not stain at all. This is 2 coats with no topcoat. Even though it looks quite orange it leans much more peachy. 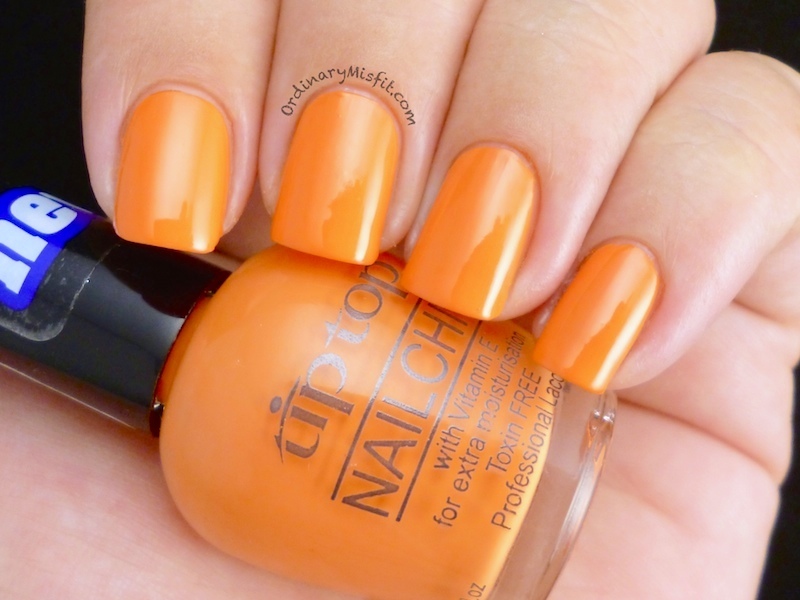 I am not sure how it will compare to Tip Top – Orange you lovely. Great formula and easy application. I almost want to put this with I’m feeling blue-tiful. Isn’t the name just super cute? This is 2 coats with no topcoat. Great formula, great application. I really love this purple shade. I think it is great for any season and also goes with many colours. Can you see this with Hap-pea? I can. I really like all of these shades even though Hap-pea is my favourite. I would really like to get my hands on the other 2 shades. Not to mention the other ranges Tip Top has coming soon. I just wish my stores were better organised. If you want to stay up to date with all the news and teases Tip Top shares then make sure you like their Facebook page. These polishes are all available at Clicks stores. What do you think? Do any of them appeal to you? Do you have any of them? Urgh it was such a mission. I got some at pavilion but had to try 6 stores. Westwood, Pinetown, pavilion, Kloof, gateway, hillcrest. Westwood and pavilion were probably the better ones. I like Hap-pea too. Can you please do a comparison to essence that’s what I mint? Purple bow peep is my fav 🙂 so pretty! Can I just tell you how stunning your nails are? The colours are amazing as well. I love it! !